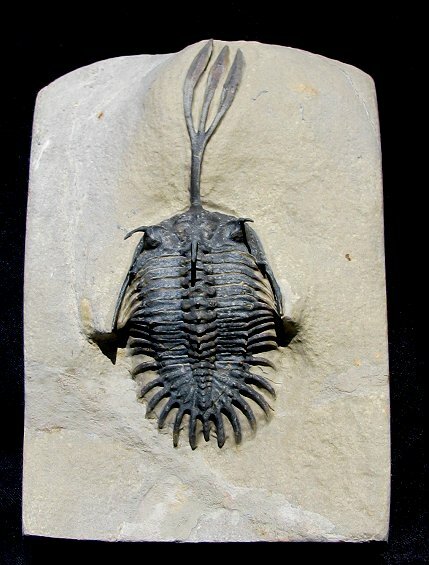 This is still one of the most unusual species of trilobites we have ever seen. 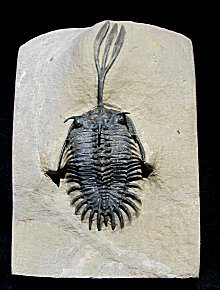 It is a complete Walliserops trifurcatus (Trident) trilobite from Morocco. It is sort of a cross between a Comura (for the overall shape), Quadrops (for the prongs off the head), and Psychopyge (for the long snout). It has three rows of free-standing spines like these trilobites, but it has something special these bugs don't have - a HUGE Trident-like projection off the front of the head! This specimen was prepared under a microscope here in the US at the EXTINCTIONS Preparation Lab. It represents the best features that trilobites have to offer. It has a head covered in pustules, fully faceted compound eyes, and a beautifully articulated Trident snout. And it even has many REAL free-standing vertical spines, unlike many of the Moroccan-prepared fakes you may have seen floating around. This trilobite is also well showcased on the sculpted block of matrix - what more could you ask for in a trilobite? We are proud to showcase this fabulous display specimen as a keystone example of bizarre trilobite morphology.